Heat oven to 425°F. Line 15x10x1-inch pan with Reynold's Kitchens® Parchment Paper. In large resealable food-storage plastic bag, mix frozen pizza snacks with taco seasoning mix. Seal, and shake bag to coat; spread pizza snacks in single layer on pan. Bake 12 to 14 minutes or until heated through. Push pizza snacks together until touching. Meanwhile, in 2-cup microwavable glass measuring cup, microwave cheese uncovered on High 60 to 90 seconds, stirring every 30 seconds, until melted. Stir in green chiles; microwave 15 to 30 seconds or until heated through and pourable. 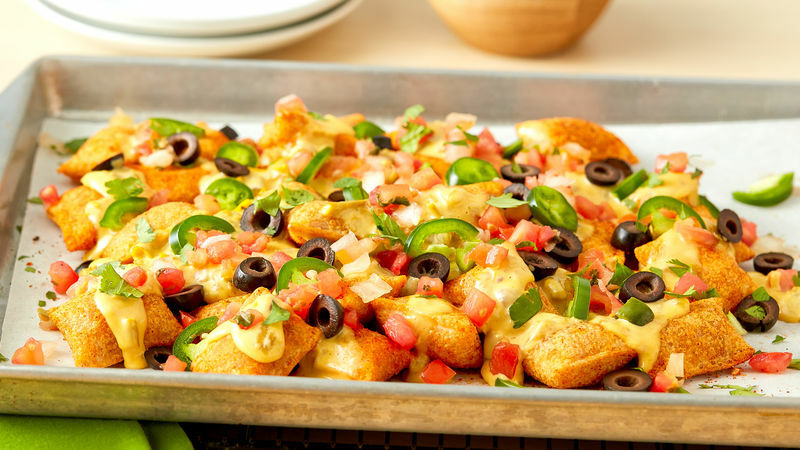 Pour warm cheese mixture on top of hot pizza snacks; top with pico de gallo. Serve topped with remaining ingredients. For a taco-seasoned dip, stir leftover seasoning mix into sour cream, and serve! Make cleanup a breeze! Line your pan with Reynold's Kitchens™ Parchment Paper or Reynold's Wrap™ Aluminum Foil.